I water colored the chair, if you don't have a WaterColor Wheel Stack Pack you should get one, great way to always have some water colors handy. The other challenges are pretty obvious. Supplies: Card Blank 5" X 7" White Value Pack Hobby Lobby, grey, blue swirls-CTMH card stock, dk. 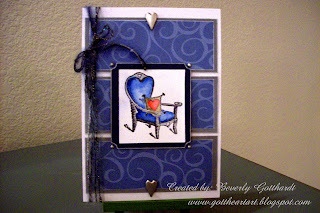 blue from scrap stash, Stampin Up-Whisper White card stock, Yarn from $ Store, Ink: Ranger Archival Ink-Jet Black, Stamp: The Uptown Design Co-Chair-Alicia Tormey, CTMH-C1088 Comforting Thoughts, Water Colour Wheel Stack Pack, Stampin Up-ticket punch, heart brads-Oriental Trading Co., Hero Arts-adhesive crystals(colored w/Sharpie Poster Paint silver pen), Sharpie Poster Paint Pen-silver, CTMH marker-outdoor denim, water brush, Hot Off The Press-stacked heart stickers, pop dots. That chair is awesome! What a wonderful card. Thanks for playing with us this week at Pile It On! What a sophisticated card Beverly, the colour look so rich and really suit the image. Thanks for joining in at Rosie Dees this week. Wonderful card! I really like the layout (will have to remember this one!) and your colors are beautiful! Thanks so much for joining us at SSC this week! Hope to see you next week - Good Luck! Wonderful card inside and out Beverly, love the image and great sketch. Great card Beverley, I love the image! Thanks for joining us at RD this week. Thanks for joining us this week on Rosie~Dee's challenge & tackling this difficult subject. Lovely card, very elegant. Thanks for joining us at SSC. What a pretty card. 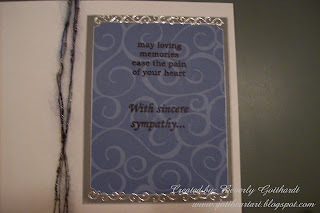 Love the silvery hearts and how you've framed the image. Great coloring. Lovely inside with the sympathy text. thanks for joining us SSC this week. thank you for join us at rosiedees this week. hope you join us again soon. you are rocking us every week!!!! wow love it!!!!! so rich!!! Thanks for Playing with us @ Pile It On! this is a beautiful card, just love that chair stamp! Stunning color choice....love the blue and the silver...fantastic card, great take on this weeks challenge! I'm so glad you could join us this week at the Stamptacular Sunday Challenge! This card is absolutley GORGEOUS! I love the deep blue color you've used...so rich! I'm sorry I'm just now getting around to commenting on your card but I just haven't been able to keep up with everything these days. Better late than never, right? Please forgive me! Anyways, I'm so glad you were able to play along with us at Stamptacular! Hope you'll join us for some more challenge fun soon! Gorgeous card! Love that image and your coloring! Thanks for playing with us at Pile It On!